I know other people don’t like the no-reservation policy because when we got out of our vehicle a 4:58 pm groups of people from two other vehicles followed suit. We were all seated promptly at 5 pm and the tiny dining room that seats less than 20 filled up within the hour. The menu changes regularly, but based on what we got I can only assume I’d love anything they’d offer. Their menu seems to be broken into three categories — appetizers, small plates and entrees. We decided to go all out and get an appetizer, a small plate, two entrees and a dessert. For our appetizer we had to get the braunschweiger sandwich because both of us genuinely like braunschweiger. 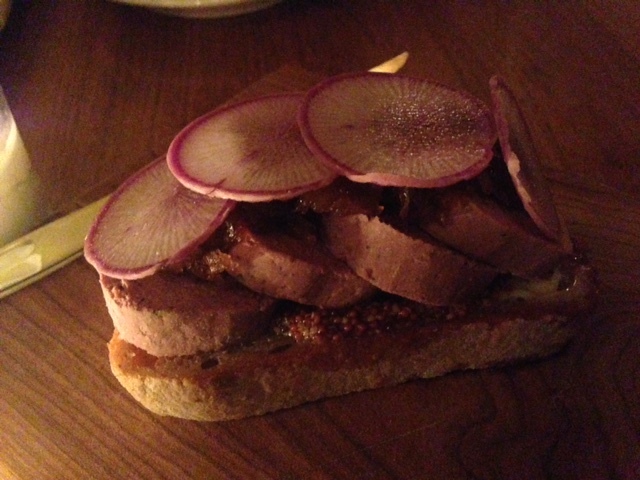 The open-faced sandwich comes on toast with caramelized onion jam, mustard and radish. Braunschweiger can be fatty, greasy and sometimes the flavor can be a little sour or oddly seasoned, but Underground Meats clearly knows what it’s doing. Their braunschweiger was creamy, and was seasoned perfectly (not too salty and just enough garlic). The radish added a nice crunch and the peppery flavor worked well with the extremely rich braunschweiger. The onion jam and mustard took the sandwich to another level. The onion jam was that perfect combination of sweet and savory, and the seedy stout mustard was perfection. I loved how truly Wisconsin the sandwich was. For our small plate we got a warm potato salad with a fried egg vinaigrette, pea shoots and pickled mushrooms. The super simple fried potatoes were elevated by the toppings. The vinaigrette was rich, creamy and tangy. I’d love to learn how to make the dressing so I could have it on my salads at home. The pea shoots’ crunchiness and freshness went great with the warm potatoes and rich dressing. 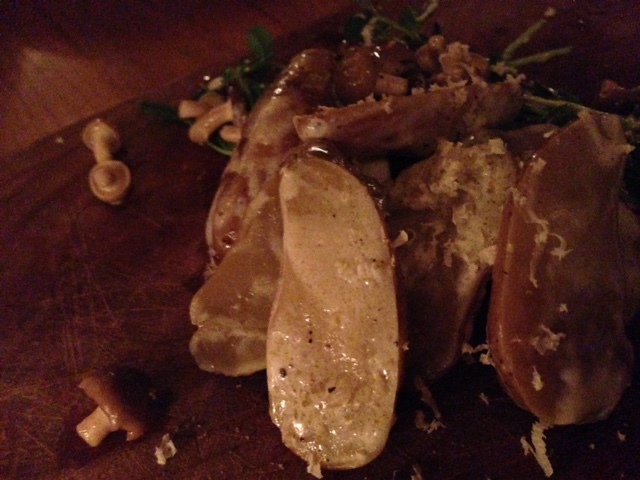 The last (but definitely not least) components of the dish were the tiny pickled mushrooms. The pickled, savory beech mushrooms helped to balance the warm potatoes and rich dressing to keep the salad lighter. It was the tastiest and most unique potato salad I’ve ever had. 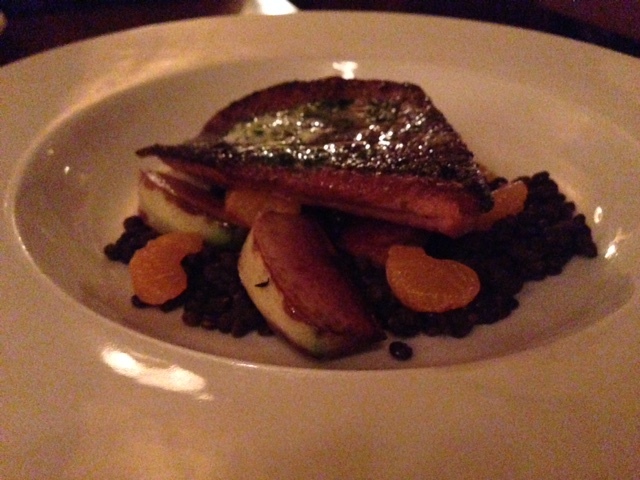 The first entree we decided to try was the Steelhead trout with black lentils, radish, burnt orange and herb butter. This dish was still very good, but less successful than the first two. The trout was perfectly cooked and seasoned, and the skin was crispy…which is the best way to eat fish! The black lentils were perfectly seasoned, but may have been slightly overcooked. The roasted radishes were an interesting touch and added a great pepper flavor to the rich dish, but the burnt orange and herb butter did not impress me. The butter was not only an unappealing color (black), but it tasted like rotten citrus and dirt…we avoided it. The random pieces of mandarin orange were also oddly out of place. 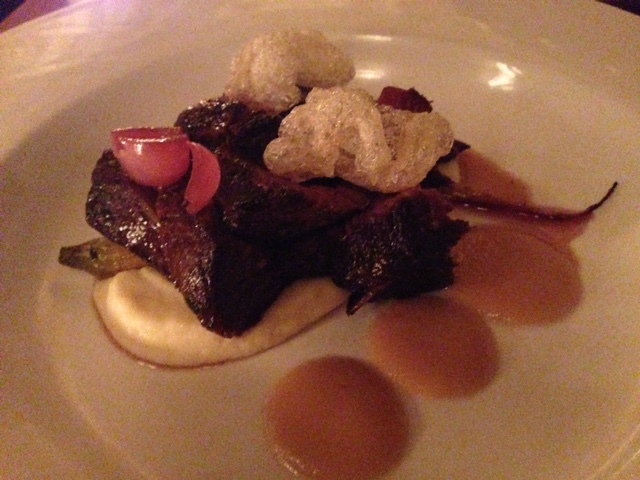 Our second entree was the hanger steak with parsnip puree, smoked carrots, soubise and beef tendon. This dish was pretty special. To start, the hanger steak was perfectly cooked and seasoned, and was very tender. Sometimes parsnips are prepared sweet, but this puree was perfectly savory. I’m not sure what the flavors were (nothing stood out to me), but it went very well with the steak. The other three components are what took this dish up 10 notches. The smoked carrots were an extremely unique flavor and I loved them. The soubise was fantastic – I had to look up what soubise was and it is described as an onion bechamel sauce. I’m not sure why an onion sauce was so good, but I wanted more of it to eat with the steak. And then the beef tendon — it was basically a pork rind. I don’t love pork rinds, but this crispy fried pork tendon was a surprising and decadent addition to the dish. For dessert we had to get the cookie plate (seriously…everyone I had talked to about Forequarter said we needed to get the cookie plate). We got four items on our cookie plate. 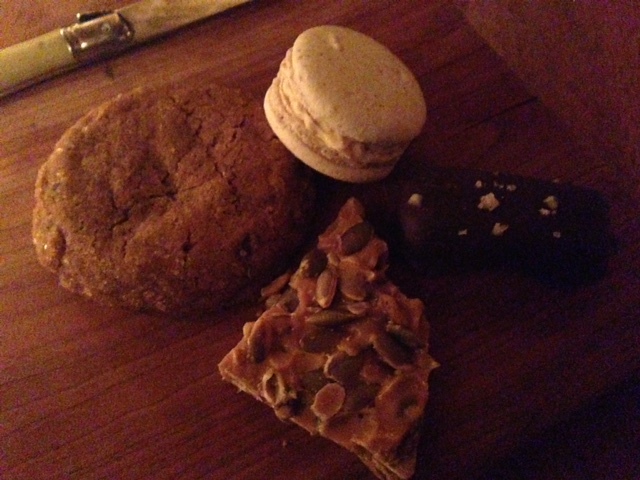 Two of them were cookies – a salted pecan macaroon and a ginger molasses cookie. Two of them were candies – pepita toffee and chocolate covered bourbon caramel. The salted pecan macaroon was as good as macaroons can get. The cookie had a crunchy shell but a soft inside and the filling was the perfect balance of salty and sweet. The ginger molasses cookie was pretty special — it tasted exactly like my grandma’s gingersnap cookies, which means it had her special ingredient in it: bacon grease. There’s nothing better than a gingersnap cookie, except a gingersnap cookie with bacon grease. I don’t usually like candies, ironically I don’t actually like toffee or caramels, but these two were fantastic. The pepita toffee was crunchy, salty and buttery. I’ve never had toffee I liked, but I loved this one. The chocolate covered bourbon caramel was the same. Caramels usually just taste like sugary, chewy messes to me, but this one was not too sweet and the chocolate and caramel had a melty consistency. I loved all four of them. 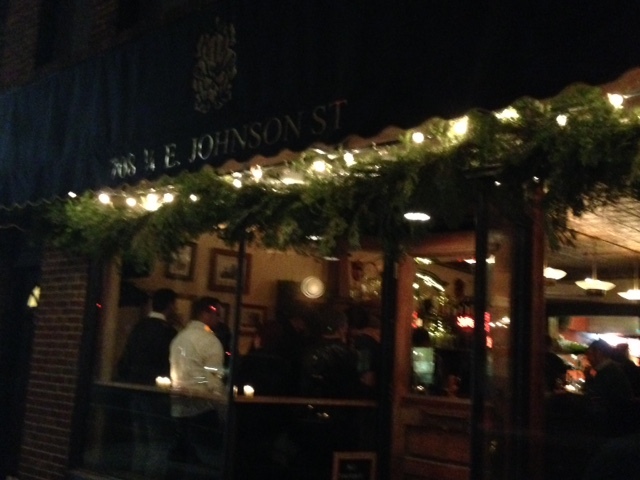 FOOD NOTES: I had extremely high hopes for Forequarter and they were all justified. The braunschweiger sandwich and warm potato salad were impeccable. The trout was perfectly cooked, but some of the components of the dish were not great. The hanger steak was great and the extra components were spectacular. The cookie plate lived up to all the hype. The prices are a tad higher than the average restaurant, but not out of the question for the quality of the food and the creativity of the dishes. I offer two suggestions when visiting Forequarter — go hungry and order small plates and appetizers over entrees.